Frustrated by President Trump's continued support for embattled EPA Administrator Scott Pruitt, Senate Democrats are vowing an all-out floor fight against the man nominated to occupy the No. 2 slot at the agency. In light of the growing calls for Pruitt's resignation, Sen. Tom Udall (D-N.M.) said yesterday he has "real concerns" over Trump's pick to be EPA's deputy administrator, Andrew Wheeler, a former Senate staffer and lobbyist who has represented coal interests. "We're going to fight Wheeler all the way," Udall, the top Democrat on the Appropriations subcommittee that funds EPA, told reporters yesterday. Should the Wheeler nomination come up this week — which Majority Leader Mitch McConnell (R-Ky.) has signaled it will — Democrats are unlikely to yield back debate time on the nomination, Udall said. 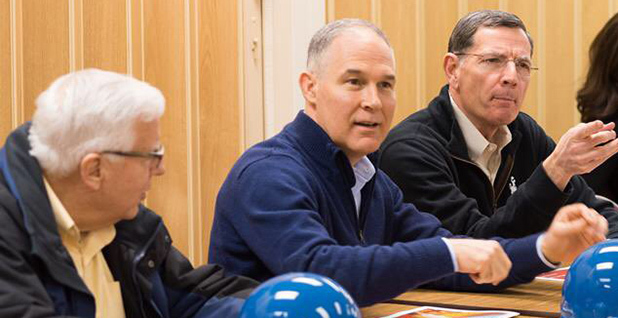 "He hasn't been through the vetting that with the resignation of Pruitt he would become the actual administrator," Udall said, adding that Democrats will "defer and delay" on Wheeler "until we get some answers" on Pruitt. Udall will appear at a news conference this morning with Minority Leader Chuck Schumer (D-N.Y.), Sen. Tom Carper (D-Del.) and other Democrats to demand Pruitt respond to a host of questions over the recent scandals, including a room he rented from the wife of an energy lobbyist, his round-the-clock security team and the soundproof booth he had installed at EPA headquarters (see related story). Carper, the top Democrat on the Environment and Public Works Committee, said yesterday Democrats will use the attention generated by Wheeler's nomination as a forum to focus on "the mistakes and maybe misdeeds of Scott Pruitt." "It's given us a lot to talk about, and we plan to use that time effectively," Carper told E&E News. However, as with Pruitt last year, it appears that Democrats are unlikely to muster the votes to block Wheeler's nomination. EPW Chairman John Barrasso (R-Wyo.) yesterday was upbeat that Wheeler would be installed in the deputy slot in the coming days. "We've had a number of Democrats who have come out in support of his nomination, and I expect he's going to get confirmed," he told reporters. Democratic Sens. Joe Manchin of West Virginia and Heidi Heitkamp of North Dakota have already said they plan to back Wheeler, and Maine Republican Sen. Susan Collins said yesterday she was "inclined to vote for him unless there is new information about which I'm unaware." Collins, the lone Republican to oppose Pruitt's nomination last year, told reporters "there's a huge difference" between the former Oklahoma attorney general and Wheeler. Pruitt, she said, "does not believe in the mission of the agency for which he was nominated to head." By contrast, Collins said she knows Wheeler personally from his tenure as staff director on EPW. "I believe that he understands how to get things done, and while I undoubtedly will disagree with him on some issues, he did not, unlike Mr. Pruitt, sue the EPA 14 times," she said. Despite the long odds, Carper said Democrats would mount a spirited fight against Wheeler. The ranking member said, "What did Wayne Gretzky, the great hockey player, say when asked why he took so many shots on goal? He said, 'I missed every shot I never took.'" The two parties yesterday continued to spar over the role of Congress in overseeing Pruitt's alleged misdeeds, after Barrasso rejected Democrats' calls to hold hearings (Greenwire, April 10). Carper suggested there was a double standard on oversight. "If the shoe were on the other foot, if we were in the Obama administration and Gina McCarthy were the EPA administrator, the Republican majority would have dragged her in before us maybe not every day of every week, but probably every week to address and delve into her misdeeds," he said. Sen. Lisa Murkowski (R-Alaska), who chairs the Appropriations subcommittee that funds EPA, yesterday called the ongoing White House review of Pruitt's actions "appropriate," but noted that she anticipates the EPA administrator will face ethics questions when he appears before her panel for a yet-unscheduled budget hearing. Murkowski conceded that the flurry of headlines about scandals threatens to undercut Pruitt's policy agenda at EPA. "I don't think that helps anybody," she told E&E News. "It doesn't make a difference whether you're Scott Pruitt or whether you're somebody else. If there's questions that are coming up, that are detracting you from the responsibilities that you have, those are concerns." Last night, top House Energy and Commerce Committee Democrats wrote EPA's inspector general asking him to take over the review of Pruitt's potential misdeeds. They questioned whether agency ethics officials were up to the task. And ABC News reported that House Oversight and Government Reform Chairman Trey Gowdy (R-S.C.) was sending aides to EPA to review Pruitt travel records. Critics accuse the administrator of overspending on flights.